President Trump’s 2018 budget, released Tuesday, proposes considerable changes to federal student loan programs. 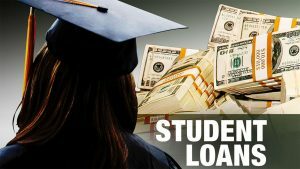 The budget contains three main proposals aimed at student loans that would apply to loans that were issued on or after July 1, 2018, but not to those used to finish the borrowers’ current course of study.. The proposals reflect the administration’s priorities in reducing government involvement in the loans business. One proposal cuts back on the number of loan repayment options available for federal student loans. There are currently four income-driven repayment (IDR) plans options available for federal loans borrowers who have difficulty making the monthly payment. Trump’s proposal reduces that to a single income-based repayment plan that would cap a borrower’s monthly payment at 12.5 percent of their income. Any debt balance remaining after 15 years for undergraduate borrowers would be forgiven, while graduate school debt would be retired after 30 years. Another proposal eliminates the program that waived debts for some former students who took jobs in public service. The Public Service Loan Forgiveness program, which is administered by the Department of Education, is directly targeted in the budget. Loans issued after July 1, 2018 would no longer be eligible for the program. The budget estimates that ending the Public Service Loan Forgiveness program would save $27 billion over the next decade. According to a study conducted in 2016, the median debt load of those enrolled in public-service loan forgiveness is more than $60,000. Roughly 30 percent of people who have been certified for the program have borrowed over $100,000. The document also proposes changes to Pell Grants, federal grants issued to students based on financial need. Under the current budget proposal, $3.9 billion would be cut from the Pell Grants reserve. The government spent $28.2 billion on Pell Grants in 2015-2016. Student advocates criticized the proposals’ details. They worry that eliminating the targeted federal aid options would cause loan balances and defaults to rise. More than $1 trillion of the $1.4 trillion in student loans outstanding are federal ones issued by the Education Department. Roughly six million undergraduates receive subsidized federal loans each year, according to advocacy group Institute for College Access and Success (TICAS). It’s unlikely that all of Trump’s proposals will be enacted. Congress will need to sign off on the budget, since Congress sets the spending priorities for the federal government.